The Young Vic’s version of Henry Ibsen’s classic play is a cleverly creative take, bringing the themes of Ibsen’s original to the forefront of modern day society. The play is a study of the darkness of secrecy and how it can shatter relationships. 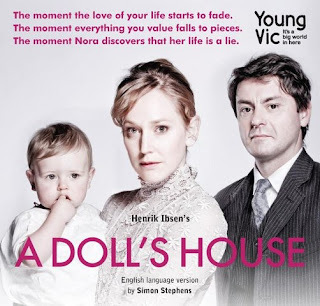 Hattie Morahan plays the role of Nora with exuberance and passion. Her ability to switch from doll-like role to her husband, to a very trying mother and wife to her childhood friend, Christine, is remarkable. What strikes me most is how the audience feel rather grated by her childlike and shallow personality; wherein even the mentioning of the word money lights up Nora’ eyes, to feeling rather sympathetic of her by the end of the play. Scenes which highlight Nora’s role in the house are highlighted by the way in which she dances the tarantella for her husband; the notion of pleasing her husband by looking beautiful on his arm and at parties to show off proudly speaks volumes about their relationship. What’s more, the ban of chocolate imposed in the house further highlights this. The way in which the married couple interact with one another underneath the disguise of domestical bliss, is full of tension and unsaid words. The audience are left gripped and humoured at the same time. Nora is a trapped, not only by her relationship, but by the financial situation she faces, which in turn acts as a catalyst for her to walk out of her life. The skilfully designed set is beautiful and plays a large part in creating the mood for the scenes. The revolving set shows times passing and makes the problems that Nora faces ever more real. Parallel to this, the music and sounds heighten to mood and give the audience a real feel of what’s to come. I especially admire the way that The Young Vic manages to put on stage an old classic revived in a way that it shows its relevance in modern day society. The presence of a baby emphasizes the realities. Fascinating, wonderfully creative and highly commendable acting. One not to be missed.